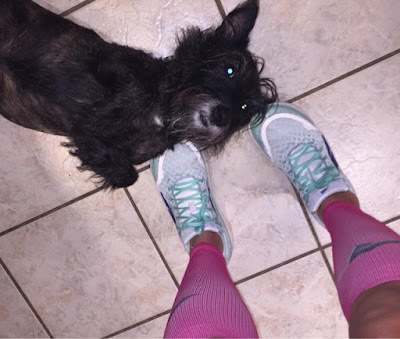 Welcome to my Altra Running Paradigm Shoe Review! A few weeks ago, I was blessed with the AMAZING opportunity to attend Runner's World and Half Festival Presented by Altra. I am still trying to come down from my runners' high from that race. (It may take a while ;). 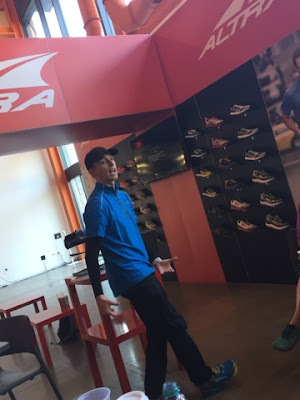 One of the coolest experiences that I had that weekend was being fitted for an Altra Running shoe by the OWNER and FOUNDER of Altra Running, Harper Golden. Seriously. That's pretty cool. Since I had broken my ankle and wasn't really in the shape to be running just quite yet, I wanted an extremely cushiony and stable shoe. Right now, I'm still a walker with an unstable ankle. ugh. He suggested that I try out the Altra Paradigm model. Perfect. I'll do whatever he suggests. He's Mr. Altra so I went with it. At this point in my healing, I was 6 weeks post break and was not even entertaining the thought of running. 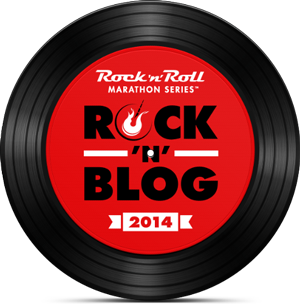 I knew that I was pushing it with the thought of even walking a half-marathon. There was NO WAY that I was going to even attempt the 3.8 mile trail run, 5K and 10K that I registered for as well. NO WAY. 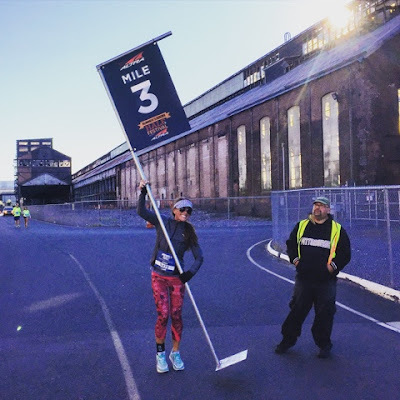 My physical therapist gave me the go ahead to walk the Half but I was still nervous. I was thinking that I needed to take it really really slow. I was going to be wearing a brace but I was still nervous. When Harper slipped that shoe on my foot, everything changed. The Paradigm had so much cush and was so stable that I felt like I was walking on air. Or Springs. Or Heaven. What is this miracle shoe?!?! I started walking around in them. There was a natural "rocking" motion to this shoe. Very similar to the way my boot had been making my foot rock. My foot felt so secure. This shoe plus my brace....who needs a Boot?? I instantly started re-thinking my race options. Mayyyyybe I would consider the 5k now. Mayyyybe I would consider the 10k now. Maybe. There is still NO WAY that I would attempt the Trail Run. NO WAY. Love these...let's lace them up! 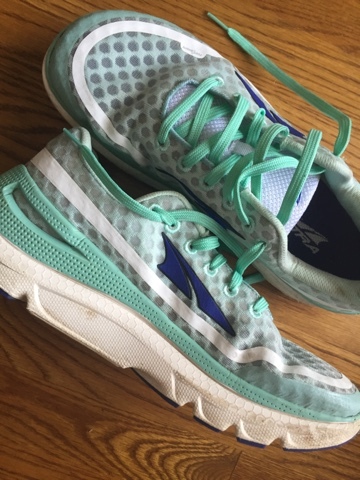 These shoes felt SO different than any other running shoe that I've ever owned. The toe box was wide. And Curvy. The shoe felt like it rocked when I walked and I felt like I was two inches taller. Again, I've never felt anything like these shoes before. What is this whole Toe Box thing about?? 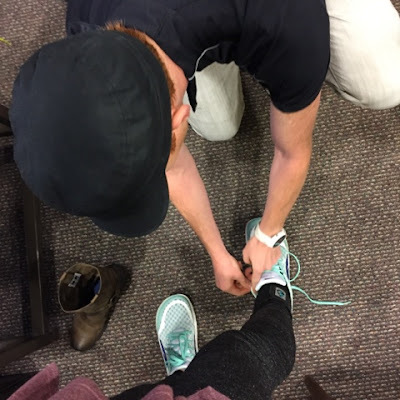 "Wearing a shoe with a FootShape™ toe box is a whole new experience! It should not feel like a traditional shoe and will likely feel too loose in the forefoot at first. We recommend fitting your shoes with a thumbnail's width (about 2/3") between your longest toe and the end of the shoe. This may be more room than you are used to, but giving this room will allow your feet to be more relaxed and powerful. If the fit is correct, the shoes will likely feel "too big" around your toes, while being secure from the ball of your foot back through the heel. Most people get used to this feeling in a few hours to a few days. 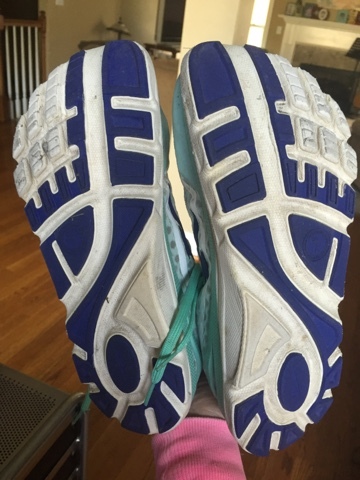 Proper toe box fitting can help eliminate black toenails, blisters, and foot fatigue. Traditional running shoes feature pointy toe boxes that squeeze the toes out of their natural position –increasing risk of bunions, hammertoes and plantar fasciitis. Altra's FootShape™ toe box allows the toes to relax and spread out naturally and the big toe to remain in a straight position. 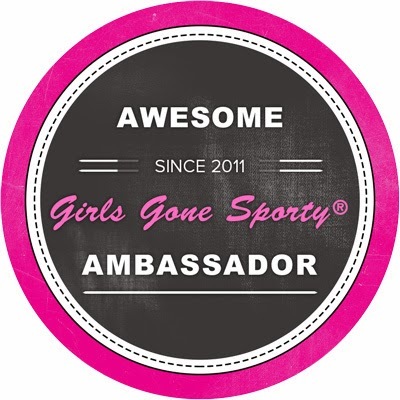 This enhances stability and creates a powerful toe-off to maximize running performance. 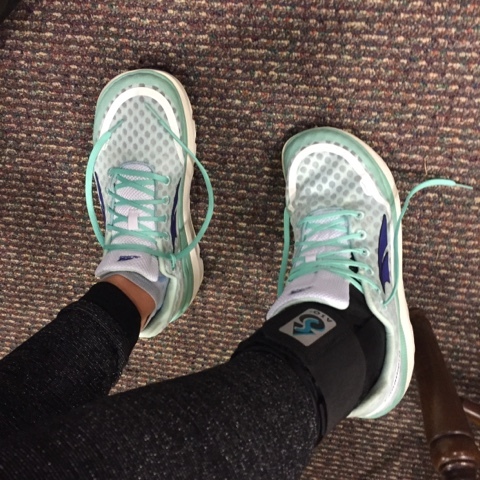 We wish we could call it some scientific breakthrough, but we're simply giving your foot the working space it needs." 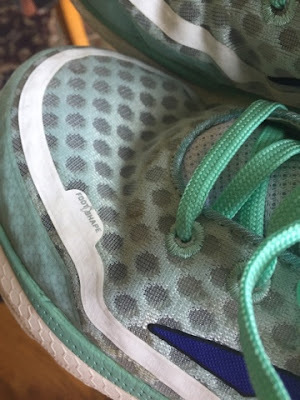 There's even a tag on the top of the shoe that reads "Foot Shape"
The bottoms of my shoe....They really are the shape of my feet! Altra is know for its' Zero Drop technology...what does that mean?? Promotes proper form to reduce initial impact by 3–5 times. Altra's complete line of Zero Drop™ footwear separates us from most running shoe companies that feature shoes with elevated heels. Running in elevated heels removes the foot from its natural position and encourages high-impact over striding." No wonder I feel taller! Fast forward to the next morning. This is when I will eat my words for breakfast. Our group took a mini-sneak preview of the trail run course. I wasn't sure how this was going to work. We got to our destination, met with the Altra guys and they explained the importance of having a proper trail running shoe. We then proceeded to go preview the course. And by that, I mean the entire group took off running. What??? I couldn't run. I'm terrified now of trails. I hate rocks. Oh good grief, I gotta keep up. So I started walking to keep up. I walked a little bit faster. This is not so bad. I'm not even feeling the terrain under these shoes. THANK YOU ALTRA. The cush is amazing. I can do this. I DID do this. No ankle issues. No unstable feet. MIRACLE SHOES, I TELL YA. MIRACLE SHOES!!!! 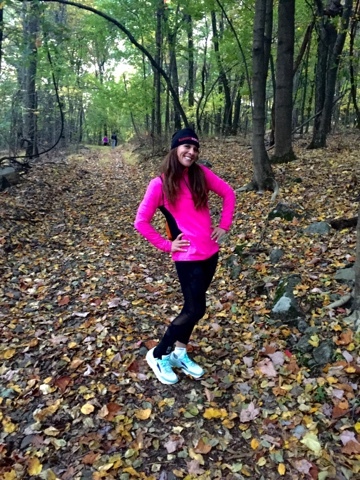 This photo was taken as we were out on the preview for the Trail Run. Start Line of the 3.8 Mile Trail Run....I CANNOT believe that I'm about to do this. 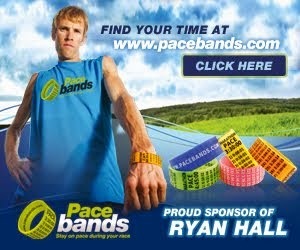 This was a no-brainer now, I conquered the hardest race to me, the trail run. Distance is not an issue for me but unstable terrain terrifies me. Now I was determined to finish all of these races. 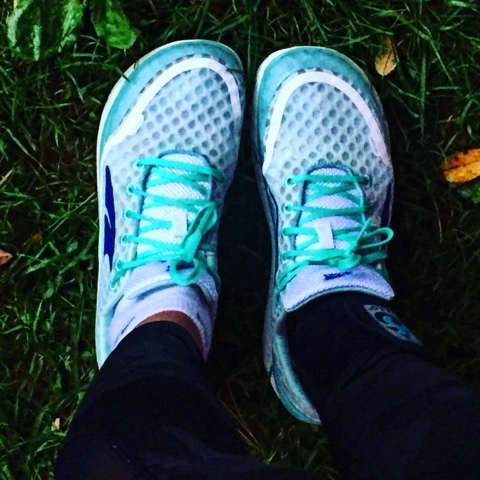 I had a few other personal factors that helped me in my decision to go ahead with these races but my new kicks definitely gave me the confidence that I needed to make this happen! I finished the 5K! My feet were feeling fabulous! Now on to the 10K! My friend Larisa and I finished the 10k! Again, no issues in my Paradigms! 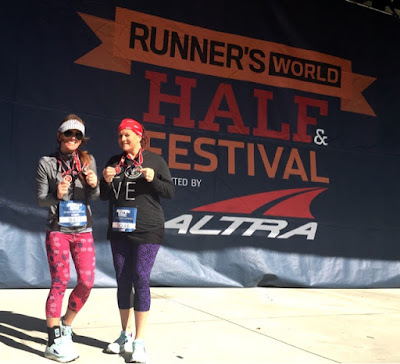 After finishing the Trail Run, the 5k and the 10k in my new shoes, I made the decision to attempt the Half Marathon in a different pair of non-Altra running shoes and wear my new Altra shoes post-race. That was the perfect decision for me. 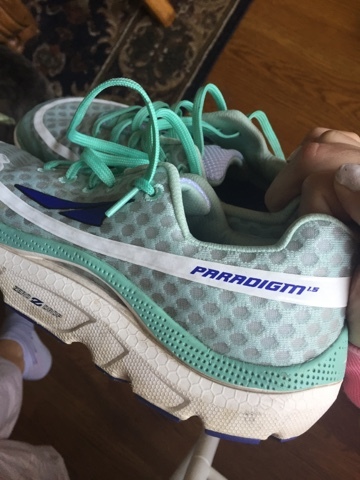 After I completed the Half Marathon, I wore my Paradigms and it was just the recovery shoe that I needed. 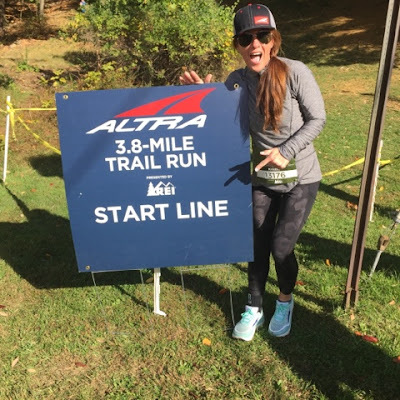 I knew NOTHING about Altra Running shoes before this weekend and by the end of the weekend, I was a total believer in this shoe. I believe in the mechanics of the shoe and the importance of the foot-shaped fit. These guys have inspired me to take care of my feet and body better and also have invented my miracle shoe. 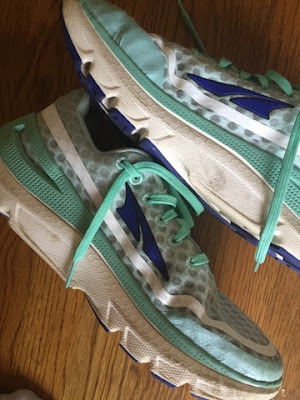 I am so very thankful for these shoes and am looking forward to my next pair of Altra Running Shoes. I don't think that I will always need the shoe with the most support but while I am healing from a broken ankle, the Paradigm model is PERFECT! 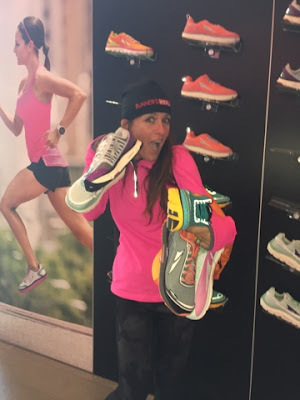 My Biggest Decision now is which Altra Running Shoes to try next!! Disclaimer: I was provided a pair of custom fitted Altra Running Shoes for my own personal enjoyment. 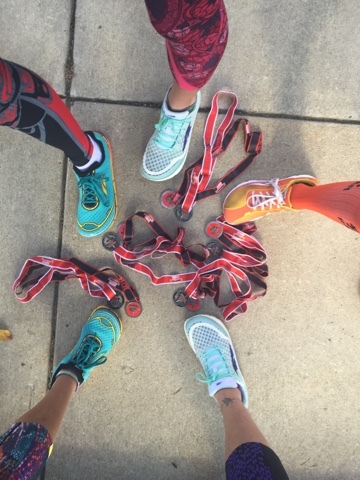 This post is not required but I love them so much and will forever be grateful to the shoes that got me through three races at Runner's World Half Festival Presented by Altra. I will continue to purchase Altra Running shoes in the future and encourage all of my running friends to do so also!